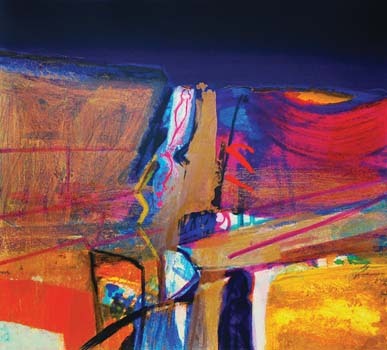 Her work combines the influence of landscape and travel with painterly abstraction. Although she does not like the term landscape painter, the importance of place is very apparent in her works; in particular the human traces and patterns of history that are left on a landscape. Spain is Rae's favourite destination, providing her with endless inspiration as we can see in her latest work. Her printmaking has been integral to her artistic activity since her student days. The way she conceives and works on her monoprints, screenprints and etchings complements and informs her approach to painting. The discipline imposed by these media and the unique opportunities offered by them create a set of possibilities, which stimulate her vision of the world, whether she is drawing, painting, making prints, or simply observing. 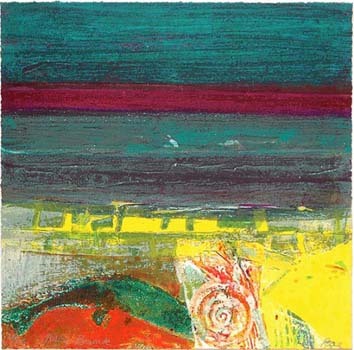 Among her many awards are Major Scottish Arts Council Awards (1975, 1981), Guthrie Medal, Royal Scottish Academy (1977), Royal Scottish Academy Sir William Gillies Travel Award (1983) Calouste Gulbenkian Printmaking Award (1983) and Hunting Group Prizewinner (1990).